An electric skillet is a great addition to any kitchen as a versatile tool with many different benefits. It easily expands the area you have for cooking by giving you an extra pan outside of what fits on the stove. Many pull them out on warm days because they are known for not heating up the house as much as having the stove or oven going. Last, they are known for having a wide range of different features and cooking abilities including pan frying, deep frying, and sauteing. Some even do very nicely at making cakes if you are looking for baking capabilities. When you're looking for your first or next electric skillet, safety should come first. Look for an electric skillet with a shorter cord to keep it closer to the wall then the edge of the counter. Some have a lockable lid as an added feature to increase safety. Next, check to see if the heating mechanism breaks away from the skillet. If it should fall, the mechanism and skillet should easily detach. The construction of the electric skillet should also be a consideration. Some come with a non-stick coating while others are made with stainless steel. An electric skillet with a non-stick coating is a nice addition but requires extra care. How the skillet heats and the range in temperature settings makes a difference when considering how you plan on using it. Size is also a factor when choosing and is based mostly on personal preference and how you plan on using it. If you are planning on fixing larger meals or using it as an addition to a buffet style meal, a larger electric skillet would be a better choice. If smaller meals for one or two people is closer to your needs, choose a smaller electric skillet would make a nice addition. Also look for how easily it cleans, what fits into your budget, and specific features you are looking for. 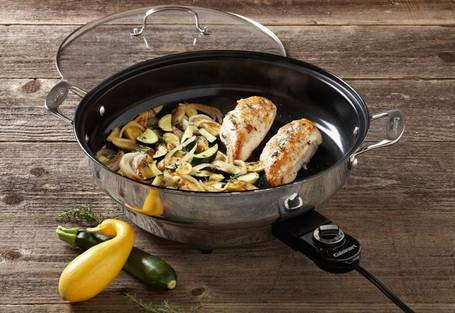 The Presto 06857 16in Electric Foldaway Skillet offers many different features. With its 16 in base and high sidewalls, this electric pan offers the ability to cook a wide range of different dishes from roasting, frying, one dish meals, and baking. The handles are stay-cool handles to prevent burning and the heat control easily maintains the temperature automatically. The heating mechanism easily detaches. Extra features include a built-in pour spout which doubles as a spoon rest. It comes with a tempered glass lid so you are able to look in as you cook without having to remove the lid. As a foldaway, it has a storage feature where you are able to detach the base and handles and store them away inside the pan. This storage ability also aids in cleaning as the pieces can be broken down and cleaned individually or placed within the dishwasher. These makes cleaning and storage of this electric skillet a great choice for RVs and other storage limited kitchens. The pros of this skillet include its close to 3 in deep making it capable of handling many different kinds of cooking needs. With most of the pieces are dishwasher safe and it's non-stick coating, it is known for its easy cleaning. Buyers often remark on how there are little or no cold and hot spots when cooking as well as how easy it cleans. The electric skillet reviews list a few cons for the Presto 06857. Most are concerning the Teflon coating, which doesn't have a long life and can easily be damaged. While the non-stick coating is very nice, it does require extra care and attention to extending its life. This is not just with cooking and cleaning, but also with the storage feature of the Presto because the metal strips can rub against the Teflon causing damage. There is also discussion over the tempered glass lid where a few have experienced the lid exploding. Overall, the Presto 06857 Foldable Electric Skillet offer a wide variety of features where others only offer some. It could be easily considered one of the best electric skillets with a number of features that it offers when compared with its price tag, which is just under $50. These features include the pour spout, spoon rest, and storage abilities. 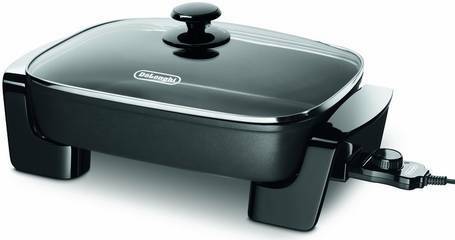 With its large capacity and buffet style skillet, it is a great addition for those who are looking for an electric skillet for large meals. When looking through electric skillet reviews, this electric pan rates high on the list of suggested skillets. De'Longhi BG45 Electric Skillet begins with its embedded heating element aimed at eficently heating evenly. With it's cool touch handles, there isn't a worry about burning yourself when you go to stir or move this electric skillet around. It offers a 3 inch deep non-stick coating pan capable of handling many different kinds of dishes. 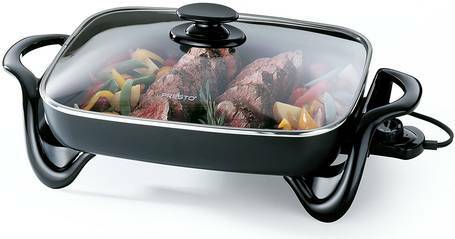 It comes with a tempered glass lid which includes steam vent holes you can adjust to your cooking needs. The detachable base and the lid are noted for being dishwasher safe which makes cleaning up much easier. The pros of this electric skillets begins with its deep pan which measures 3 in from the bottom to the rim offering a lot of volume. A lot of the customer reviews on the De'Longhi often discuss its feature for being dishwasher safe as it is a lot easier to clean and the vents on the lid are a nice addition and a great aid in cooking. Most how have purchased and reviewed this electric skillet give it high ratings. The cons of the De'Longhi BG45 are that it doesn't have alot of the extra features found on some of the other models. Some electric skillet reviews mentioned how the base and the lid were dishwasher safe, but not all of the pieces of the De'Longhi. Also, as with most non-stick coating skillets, there was discussion over the coating not lasting as long. If the depth of the skillet is a feature high on your list, this electric frying pan offers you plenty of volume. It is known to be fairly easy to clean, although there is a suggestion of reading carefully through the instructions for which pieces are considered dishwasher safe and which are not. One of its features, unlike the other, is its adjustable steam vents in its lid. Overall, this is a highly rated electric skillet in its ability to cook evenly and easy washing, but it does lack in additional features which would make it stand out even more. The C﻿﻿uisinart ﻿﻿CSK-150 offers several features beginning with being a stainless steel construction rather than the teflon non-sticking coating. It has a large surface area at 12 in by 15 in. Including a pan depth of 2.5 inches, it offers a good volume size for all your cooking needs. The temperature control offers a range of warm up to 450 degrees. This gives you the ability to just keep something warm while you are waiting to eat all the way up to your deep frying needs. The lid for the Cuisinart offers a glass cover steam vent and a stainless steel rim. It's large handles gives you the ability to easily transport this electric skillet from one place to another. The last main feature for this electric skillet is being much lighter then most models. While most are an average of 8 lbs, the Cuisinart CSK-150 comes in at about 4 lbs adding to its ability to be easily moved from one place to another. The pros of the Cuisinart CSK-150 includes its large surface area and volume making it a good choice for those who are cooking large meals. Because it is stainless steel rather then having a non-stick Teflon coating, it is known to have a longer life span. It also comes with a recipe book contains 30 recipes and the instructions for using this electric skillet. When it comes to the downside of the Cuisinart, the list is a little more then other. 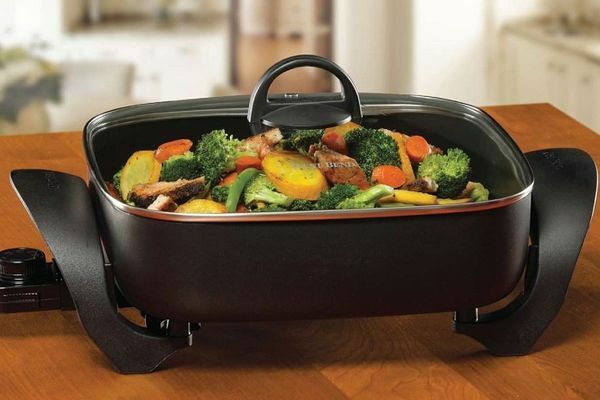 It lack a lot of the features found with many of the other electric skillets such as having a base, being made for buffet style meals, and adjustable vents. While it comes with larger handles, they are not made to keep cool so you need to be extra careful when handling this pan. The electric skillet reviews state that many hear a buzzing sound when using it. The Cuisinart CSK-150 offers features that other electric skillets don't including is large surface area and volume as well as its stainless steel construction. When comparing its features as well as the challenges of this model, it may be considered a price a little too high, at just over $100, when compared to the number of poor customer reviews it received. Many electric skillet reviews rated this electric skillet highly, yet customer reviews of this electric skillet didn't agree as just over half of its buyers would recommend it. The Presto 06852 Electric Skillet biggest feature is its non-sticking coating which is not only on the inside, but also on the outside of the skillet which aids in cleaning it. Especially because it is noted for being fully immersible and dishwasher safe too. The next notable feature is it 3 in deep pan and a little larger surface area. When it add in that its lid is rounded, it adds a little extra height when considering what you are cooking. When thinking about the extra volume this model offers, it is also setup to work great for a buffet style meal. The pros of the Presto 06852 include its non stick coating and easy cleaning. Many electric skillet reviews discuss its even cooking and a good skillet to use for warm summer days. One specifically shared that this electric skillet lasted for many years and was still going strong. Another notable feature is that, while it might lack some of the extra feature, it is a little cheaper then some of its companions. The cons of the Presto 06852 include how it doesn't include detachable bases and adjustable vents on the lid. The lid, actually, doesn't contain a vent at all. Several buyers discussed the short life of the coating and a lid which shattered during cooking. Overall, the Presto 06852 Electric Skillet offers an overall good skillet. It doesn't have alot of the extra features that many of the others do, but comes as a little cheaper price when compared to its companion, the Presto 06857. As with all non-stick coating electric skillets, its coating requires extra care and a possibly shorter life span then its stainless steel competition. When looking into buying an electric skillet, there are many different features to consider. Start with what you are willing to pay for an electric skillet as well as the different ways you plan on using it. On the other side, consider the extra features that you really would use as having those features will saving you time and effort in the kitchen. Next, take the time to consider whether or not you want to have a non-stick coating or a stainless steel. A stainless steel model means you can avoid all the challenges with having a non-stick coating and increases it lifespan. On the other side, keep in mind all the specific care instructions when it comes to having a non-stick coating electric skillet, especially when it comes to whether or not it is dishwasher safe. Some models are completely dishwasher safe, short the detachable heating mechanism while other only offer pieces which are dishwasher safe. An electric skillet does make a very nice addition to any kitchen with all the features they offer. 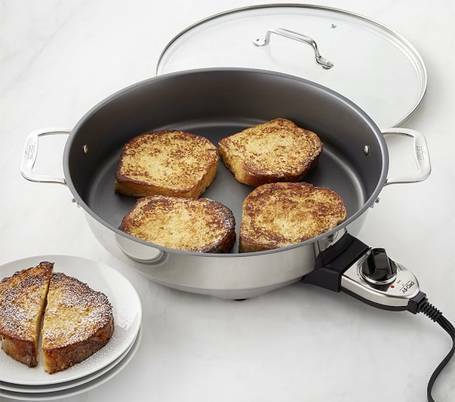 The models discussed above will give you a good idea of the differences in the kinds of models that you will find when you start shopping for your new electric skillet.